My previous FB Live from Hamish the horse was on 16.2! I have sent out my Newsletter today to all those that subscribe to my website and if you haven’t subscribed to my mailing list please do – it is on my main page. Currently I have many one to one clients for psychotherapy (anxiety, depression, stress, fears, phobias, bereavement, addiction) and tutoring (Year 2 – Year 6) I see clients Monday to Saturday so if you would like to ring me about a no commitment assessment please call! I am now registered with the BACP as well as the NCP this means that if you wish to claim your psychotherapy through your GP (NHS) or through your Health Insurance you can do so. I have several clients that do this now! I am also fully insured and hold a DBS. My Walk and Talks started on 17.2, the walks have been in various areas: Shipley Glen, Otley Chevin and Baildon Moor. These are to help alleviate the symptoms of mental health issues – you need to get out, exercise and you need to talk in order to feel better. This helps to combine the self help strategies to keep your mental well being in a tip top place and walk with a trained psychotherapist! £5 per person every Friday take a look at the dates and please confirm to let me know you are coming. Due to low attendance on the Parents Peer Support Group which lead to me wondering about whether or not to continue with this free group. When no one arrived in Ilkley, I decided to make the group that was at Outside the Box into an FB Live session this worked well with lots of people interacting. So in future if no one confirms their attendance on Tuesday night then I will not travel to the venue and the session will be an FB Live session from my premises. I volunteer at Haven on Fridays and occasionally I sometimes work as bank staff on Tuesdays and Thursdays. I am also on Standby as a supply teacher in Primary Schools on Tuesdays and Thursdays. Becoming a trainer of staff is a fabulous new development which I am excited about and feels like a natural progression from teaching to training staff. 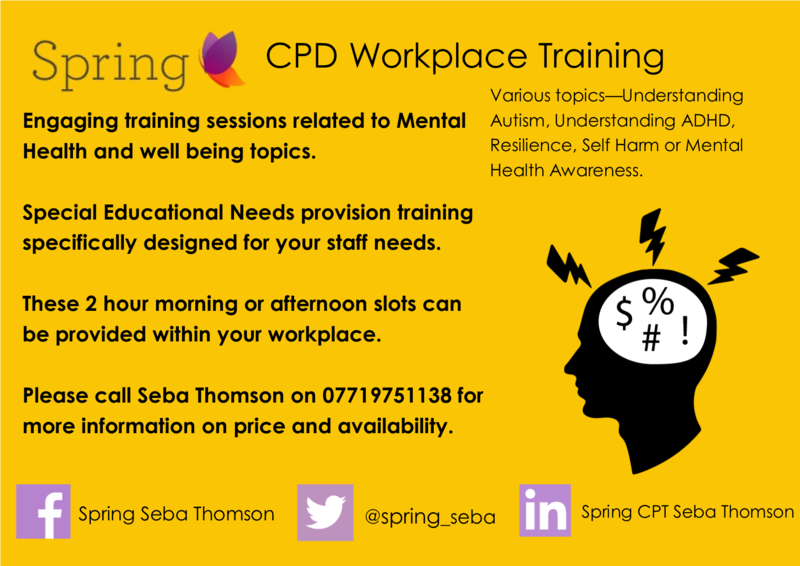 The topics I train staff in are various mental health awareness topics, Autism Spectrum Disorder, Attention Deficit Hyperactivity Disorder, etc. Clients talk to me about their requirements and I create training packages that suits their staff needs. Please contact me for further information on this! I recently completed some training in Bereavement and Addiction, Resilience and Attachment and Motivational Interviewing. I always like to keep my skills up to date through regular reading and feel my CPD is invaluable to keep my work knowledge up to date and to train and work with clients effectively, it is essential. Next week I intend to ride Hamish on Tuesday if no work gets in the way! 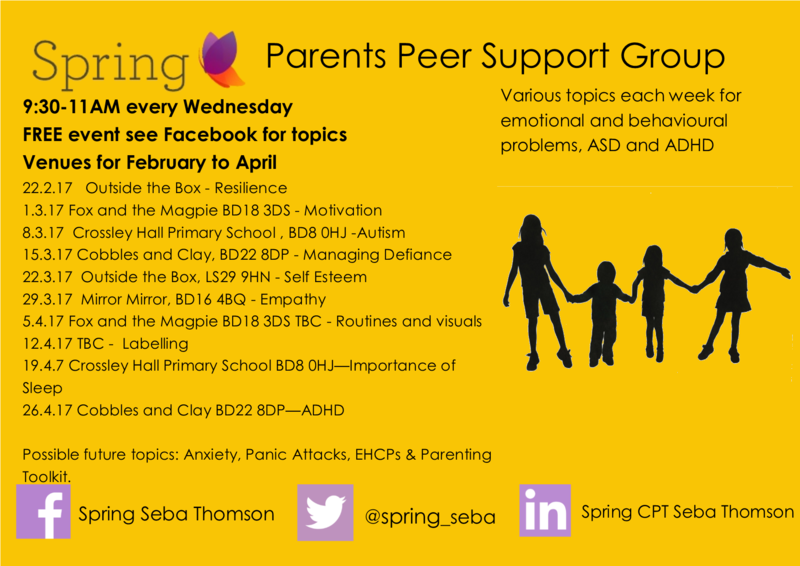 I will be at Crossley Hall Primary School and the topic is Autism at the Parents Peer Support Group. 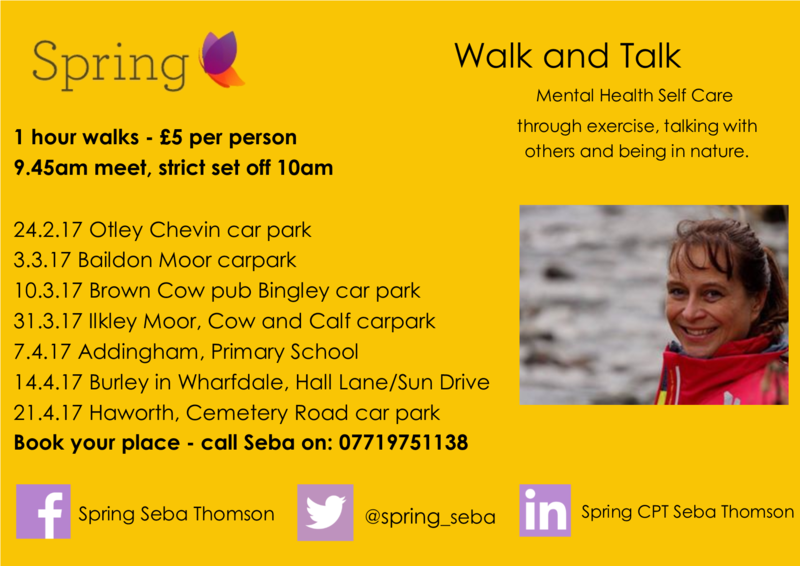 The Walk and Talk is at the Brown Cow car park in Bingley on Friday 10th. The Friday the 17th and 24th are postponed due to CPD but the next is 31 March at Ilkley Cow and Calf car park. Any questions do please ask!